His first class of the day is either Physics or Chemistry, depending on the day of the week. In both of these science classes, he is still learning about lab safety, as this is such an important piece of being a responsible scientist. In Physics, the first part of class is devoted to capturing information in the CJ about what will be covered—and what the expectations are for that day. He appreciates that Mr. Adams uses visual aids and drawings, and is always armed with lots of different kinds of examples to help the class understand concepts. "Mr. Adams always makes sure that we know what we are working on that day." Physics is Sathvik's favorite class; he has always enjoyed science courses, but he especially likes Physics at BASIS Independent Silicon Valley. Some days, the class takes lots of notes and doesn't get to work on an experiment (Sathvik was quick to assert, "I like experiments the best."). If Chemistry is on his schedule, Mr. Ryan greets the class outside and makes sure that all students are ready and focused to join him in the lab. Being thoughtful and engaged walking into a science course should be the ultimate goal for all students. Chemistry is really fun and interactive, and Sathvik enjoys sharing knowledge with his classmates and going over any information that the class doesn’t fully understand. Mr. Ryan pushes them to learn all they can, but he still makes class exciting with different activities like bingo. Next it's off to Biology or Latin. In Biology, his class is currently learning about bone structure. Mr. Barnes is Sathvik's favorite teacher: "He teaches in an easy way, like we are having a conversation." He explained that right now, they are taking a lot of notes every day, but it's because they are learning about how to conduct experiments in a safe and calculated way. He was surprised with how much you have to learn to be ready for experiments. If it's a Latin day, which Sathvik has three times a week, Sathvik heads to Ms. Odell's class. Since he started at BASIS Independent Silicon Valley this year, he didn't have Latin in grade 5 like some of his classmates. Sathvik explained that this is okay because "Ms. Odell takes her time to teach us, especially students who are new and didn't have Latin last year." Latin is one of his hardest classes throughout the day, but Ms. Odell makes sure they are prepared for everything; right now, they are learning translations and vocabulary. It's about time for a break right? It’s time to unwind and socialize at lunch! Sathvik likes to eat his lunch and then spend the rest of the hour playing basketball in the gym. It is also a good opportunity to visit his teachers during office hours, which he always does if he has questions about an assignment or topic from class. After lunch it’s time for Visual Arts with Dr. Charuhas. Sathvik said that it's a really fun class and that he has learned about a lot of things that were new to him. "I’ve never made a sculpture before but I absolutely loved doing it!" He continued, "Dr. Charuhas helped with technique and answered all of my questions." 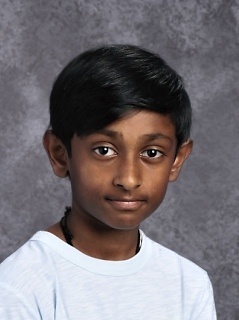 As he kept talking, Sathvik became more and more excited about the class, gushing, "all of the concepts are exciting, and it's matching up with my World History class right now, so it's fascinating to learn about the art associated with ancient civilizations." Sathvik has Ms. Miller for P.E., so next he heads downstairs to the gym for her class. They just finished a unit on football and are now doing fitness tests. "I’ve never played flag football before, but I learned that I am really good at it so I really like it!" He said that Ms. Miller is a really fun teacher and teaches them the concept so they can play properly. "She earns everyone's respect in class." After P.E, he goes to English. Sathvik honestly stated that English has never been his favorite class, but that Dr. Jensenis a great teacher and has captured his interest in the subject. "He is really nice and helps out any time a student needs it; he's always available." The class is currently reading The Endless Steppe, and he has been enjoying their lessons and activities surrounding it. Sathvik wraps up his day with World History and Geography. He thinks History is extremely interesting, and Mr. Bennetis currently teaching the class about China and the Dynasties. Sathvik explained that they do lots of reading of texts and articles, as well as take notes in class, but that Mr. Bennet keeps the classroom engaging. "We always do review games before quizzes, which ensures that we are always prepared but is also a lot of fun." He is happy that Mr. Bennett helps them learn strategies to do well on tests. Sathvik’s year is off to an excellent start on our campus, and we are thrilled to see him transition so smoothly into one of our mighty Bobcats!